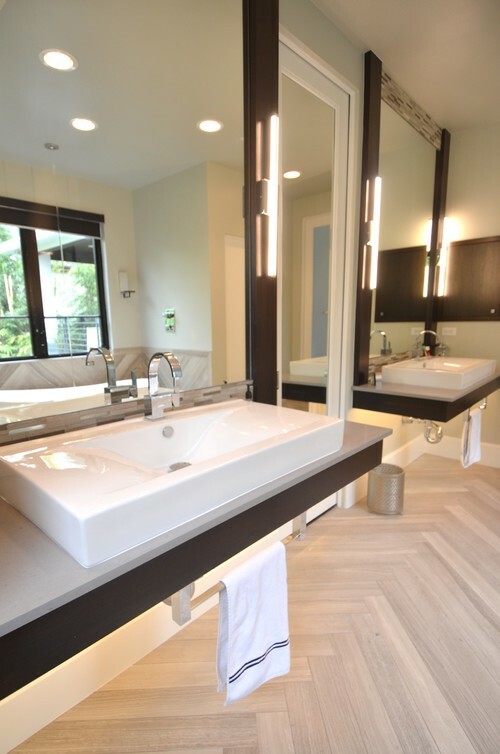 A beautiful, monochromatic bath awaits the owners of this contemporary-styled home. 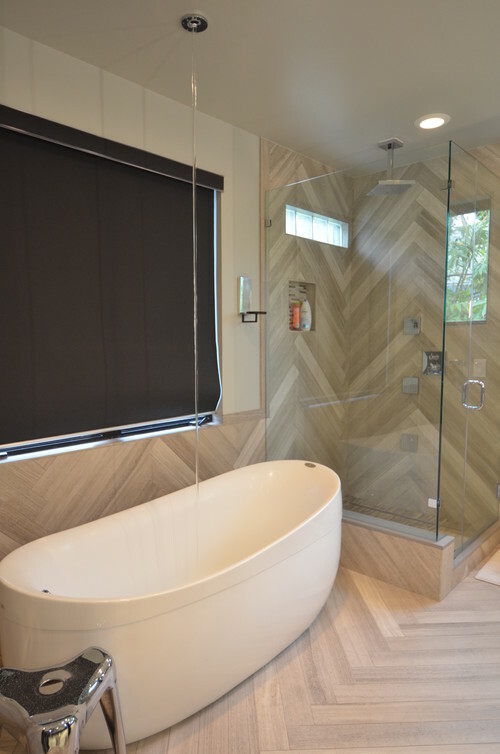 Porcelain planks that are 6″ x 24″ form a striking herringbone pattern on both the walls and the floor, leading the eye to daylighting for the shower on the left at the end. 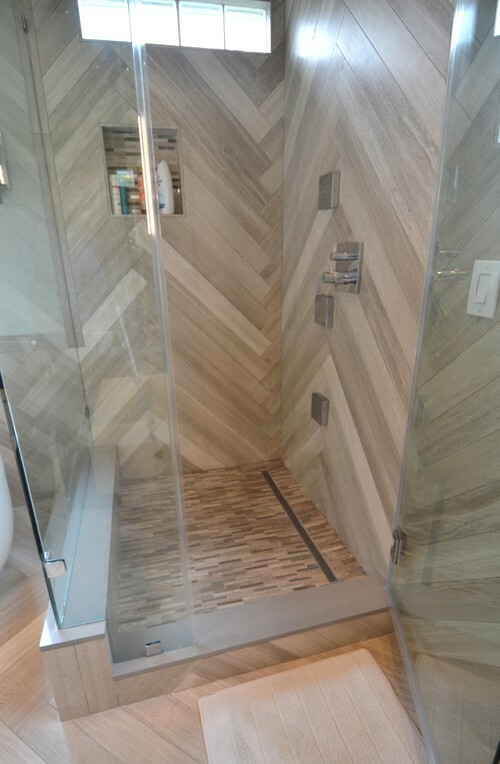 As noted, the porcelain tile planks adorn the shower walls to unify with the flooring. A small scale linear tile blend allows proper slope of the shower floor for good drainage to the trench drain. Caesarstone from the counter tops clads the shower curbs to create a cohesive look. A frameless glass enclosure lends to the spaciousness of the room, and the shampoo niche sports the same linear mosaic as the floor and the lintel above the shower opening (see other photo). Shower jets offer a full body massage, and a rain head suspended from the ceiling provides that tropical rain forest effect…. a complete bathing experience! 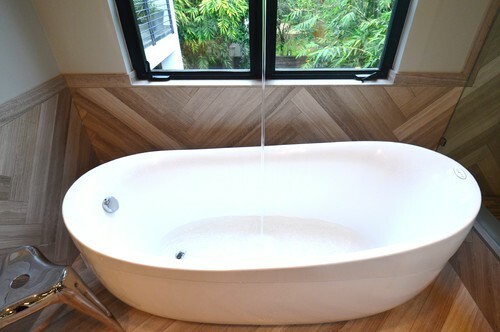 This shapely, freestanding tub is filled, of all things, from a tub-filler mounted in the ceiling! 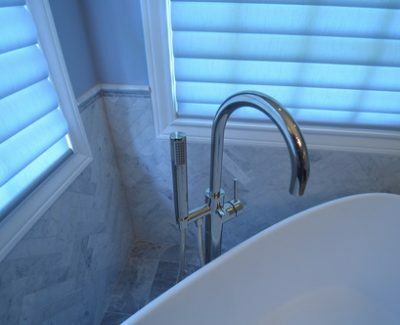 The water stream is evident in the photo with the shade pulled down, but you can see how blessed this bath is with many windows providing the welcoming daylight. The beauty of the tile work in the wainscot for the tub area signifies the quality of work and artisanship. 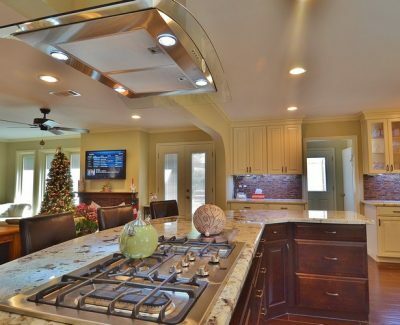 The line in the middle of the image is the stream of water coming from the tub filler in the ceiling! Happy are the owners with two vanity sinks in the en suite! 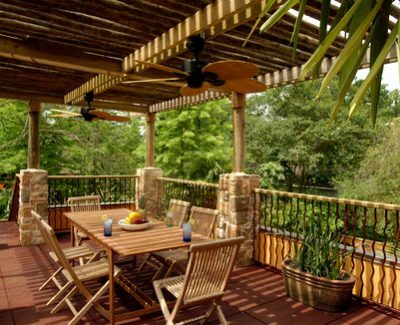 Here they have ample space somewhat side-by-side, and the vanities are lit from underneath to enhance the floating effect.. 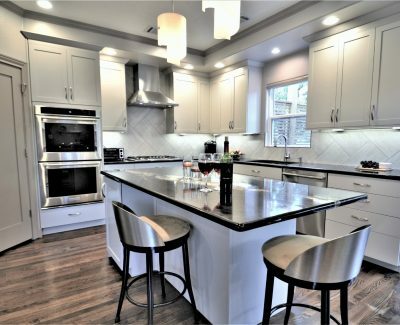 The countertops and the shower curbs are made of Caesarstone, a material called Pebbles. 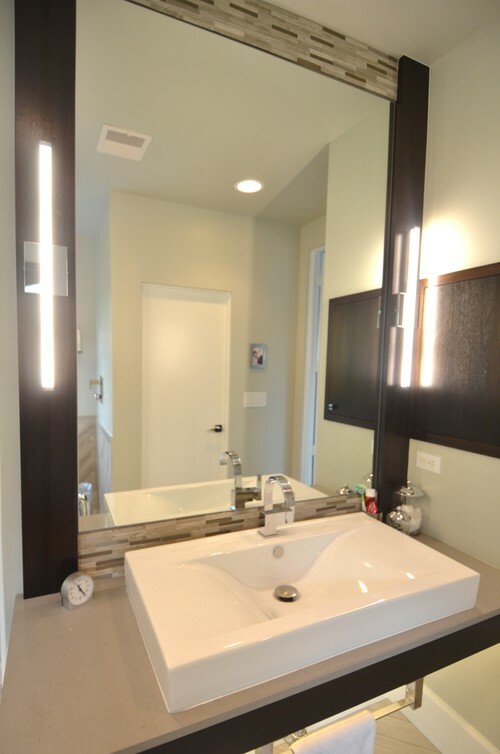 Flat vessel sinks provide elbow-room galore and tubular sconces or sidelights bring a stylish edge to task-lighting. Towel bars are readily available at the base of the sink without taking up counter space, very clever design! 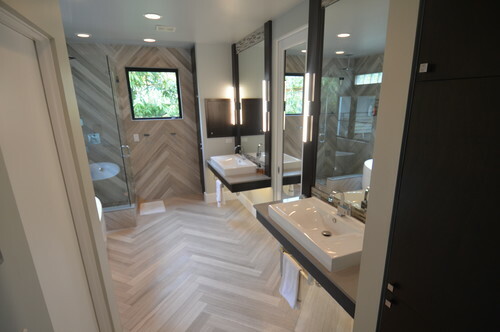 A close-up of one vanity area reveals that the small linear mosaic tile found on the shower floor and niche is repeated at the back splash and above the mirror, harmonizing the use of materials and bringing a sense of completeness to the design. 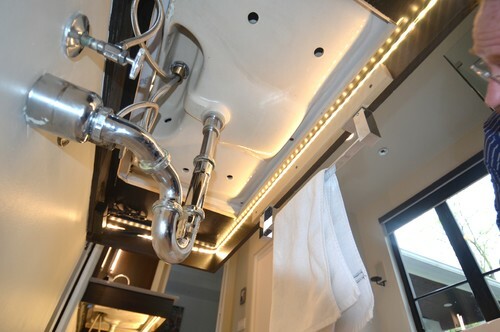 This is a “behind the scenes” look at how the lighting under the vanities is achieved, which contributes to the ambient lighting of the space.